As one of the most influential style bloggers in the world, what Bryan Boy says carries a certain amount of weight. That’s why when he tweeted the below, it’s hard not to do a double-take. This is problematic on several levels. First of all he is talking about an industry whose fashion and consumption appetite for the new is fuelled by influencers like him who rarely wear the same thing twice or at least show evidence of so on their platforms. You are talking about sustainability – which also includes the welfare of 40 million+ garment workers* – which inspired movements like @fashrev after the collapse of #RanaPlaza killed 1,134 workers, mostly women, in Bangladesh. Even if we pretend we are ignoring the social part of sustainability and just referring just to environmental part (which we really shouldn’t), how about companies like Ecoalf who creates garments out of recycled materials, having used 80 tons of discarded fishnet from the ocean so far? What about brands like Fordays which are reinventing inventory methods for the white tee or those who are creating them out of sustainably grown cotton — aka realistically something we are all gonna need new ones of every now and then? 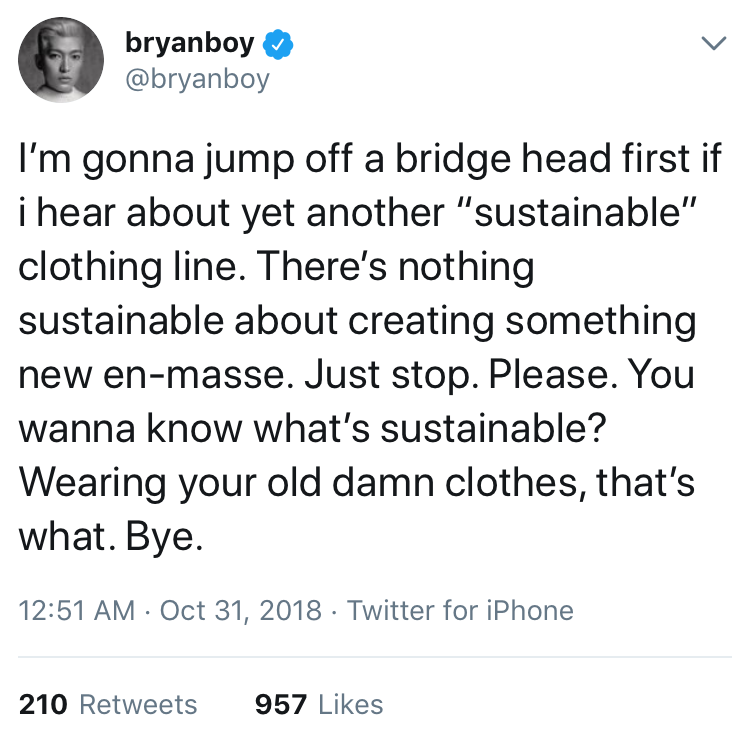 I agree it’ll all be wonderful if we all stop producing and buying tomorrow, but until we could somehow convince brands to stop making new collections and influencers like Bryan Boy to stop getting paycheques for showing off them, we need those innovators, designers and entrepreneurs who are creating better ways to make and experience fashion. We here love pre-owned, well-made clothes – and we think that is one of the best (if not the best) to experience fashion sustainably. But we still have to remember even as we we wear something old, and we get a compliment for it and share the brand name with someone we are having dinner with or with a million followers, we are still supporting that brand. Improving sustainability initiatives for fashion companies making new designs is not only good, it is necessary. It is true that some companies intentionally or otherwise inaccurately label themselves “sustainable”. But to make light of all those who are consciously trying to make the industry better (amid not always in perfect ways) in one sweeping statement is not only ignorant, putting sustainable and not sustainable into an oversimplified binary of black and white, but is really at the end of the day, just a way to justify companies who are going about business as usual, who are not claiming to be doing better, and who are most often, not doing better. If that is not the intended effect, that is the caused result. If Bryan Boy can’t imagine a better way of creating beautiful garments, he really shouldn’t put down those who can.